Method Heat oil in a pan, add cumin, cloves, cinnamon, cardamom, onion, tomato, ginger garlic paste,chillies & sauté few mins. Add cubed potato, peas, beans & all masala powders and cook until raw flavour extracts. Add cauliflower, all peppers , cashew paste & simmer for 15 min. Serve hot with Chappathi or Paratha or Rice. Looks great.. do pick ur award from my blog..! curry looks very tempting and beautiful colour. Curry looks so rich and creamy!!! 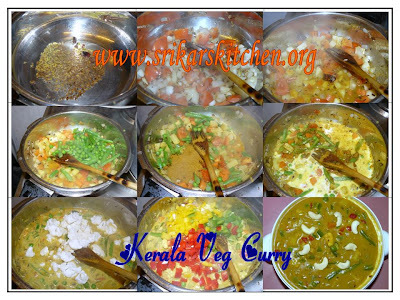 collect your award from my blog..
That is one yummlicious curry. WOW the curry looks soooooo good, m hungry now! Nice step by step pictures... and picture looks super!! I made a mixed veg curry too today:). 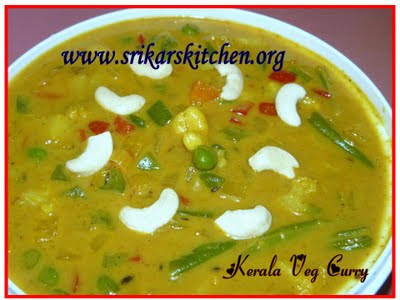 The curry looks very exotic..Nice step by step pics..
Looks rich and yummy, liked the cashews arranged on it. Looks rich and delicious! Yummy!